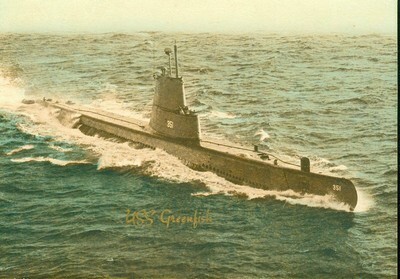 Greenfish (SS-351) was launched by the Electric Boat Co., Groton, Conn., 21 December 1945; sponsored by Mrs. Thomas J. Doyle; and commissioned 7 June 1946, Comdr. R. M. Metcalf commanding. 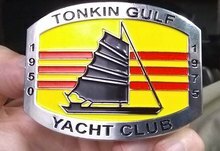 Greenfish's shakedown cruise 22 July to 13 September 1946, took her to Barranquilla, Colombia ; the Canal Zone; Callao, Peru; and St. Thomas, Virgin Islands. Exercises out of New London and in Chesapeake Bay carried her through the year, and the early months of 1947 found Greenfish, back in the Caribbean for fleet exercises. On 11 February 1947 she effected one of the first transfers of personnel from an aircraft carrier, Franklin D. Roosevelt, to a submarine by helicopter. Various exercises along the American coast and in the Caribbean occupied Greenfish until 8 January 1948, when she entered the Electric Boat Co. yards for GUPPY (Greater Underwater Propulsion Power) conversion. This conversion included the installation of snorkeling equipment on Greenfish to enable her to steam on diesel engines while submerged, which required the enlargement of her "sail." In addition, more batteries were installed to increase her submerged speed and permit the ship to remain completely submerged for longer periods. Returning to New London 21 August 1948, Greenfish sailed on her "second" shakedown cruise 1 September, with Rear Admiral James J. Fife, Commander, Submarine Force, Atlantic Fleet, aboard. She transited the Panama Canal 9 September and engaged in exercises at Balboa before returning to New London 24 September. The new GUPPY submarine was attached to the Pacific Fleet, and sailed for Pearl Harbor 23 October. She reached her new home 25 November 1948. With the exception of ASW and harbor defense exercises in Puget Sound January-February 1950 and a subsequent Mare Island overhaul, Greenfish operated out of Pearl Harbor on local exercises through 1951. Departing Pearl Harbor 15 November 1951, Greenfish sailed to Yokosuka, Japan, for Korean War duty. After a patrol 31 January to 1 March 1952, She participated in exercises at Okinawa and then returned to Hawaii 2 June. Local and special operations filled her time until 5 November 1954, when she entered the Pearl Harbor Shipyard for another modernization overhaul. Greenfish, overhaul completed 6 July 1955, sailed for deployment with the 7th Fleet 15 September and reached Yokosuka 29 September. From 19 October to 15 November She engaged in special operations, and then embarked on a tour of Southeast Asia. Ports visited by Greenfish during her 2-month cruise include Manila, Singapore, Rangoon, where she was the first submarine ever to visit and was inspected by Burmese Prime Minister U Nu. and Hong Kong. After further exercises off Okinawa and Yokosuka, Greenfish returned to Pearl Harbor 13 March 1956. The following 5 years fell into a pattern for Green-fish-local operations out of Pearl Harbor, special operations, exercises along the American coast, and periodic overhauls. Greenfish entered Pearl Harbor Shipyard 15 December 1960 for a FRAM (Fleet Rehabilitation and Modernization) overhaul and extensive conversion to a GUPPY-III class ship. This included cutting Greenfish in half and adding a 15-foot section of hull to permit more batteries and other equipment. Conversion completed, Greenfish departed 28 July 1961 for shakedown, operations at Pearl Harbor, and in December sailed to serve with the 7th Fleet. In addition to special operations, the submarine participated in various fleet and ASW exercises and visited several ports, including Hong Kong, Manila, and Okinawa. Returning to Pearl Harbor June 1962, Greenfish engaged in local operations until October, when the Cuban missile crisis sent her to Japan to strengthen the 7th Fleet. Upon return to Hawaii December 1962, she underwent a brief overhaul and then resumed her peace time schedule of local and special operations interspersed with training exercises. Based at Pearl Harbor, she participated in various ASW exercises while maintaining the high tempo of training and readiness for her crew. From 30 March 1964 to 4 September she underwent overhaul; and, after a cruise to the Pacific Coast and back, Greenfish departed for the Far East 27 January 1965. She arrived Japan early in February and during the next 4 months operated with the 7th Fleet in waters from Japan to the Philippines. She returned to Pearl Harbor 1 August, continued type training into 1966, and deployed once again to the Western Pacific 1 February 1966. She completed her duty with the 7th Fleet 1 July and returned to Hawaii later that month to resume readiness exercises out of Pearl Harbor. Into 1967 she continued to serve the cause of peace as a unit of the Pacific Fleet's powerful submarine force.